Stamp with Melva: Did you notice my new blog banner? I designed it using My Digital Studio 2 (MDS2). It was so easy to do! I can't wait to make some photobooks! Once you get started, you can save on digital content 31% off for the month of August on a great selection. To help you get started, or if you're already using MDS, MyDigitalStudio.Net is a great resource. You can learn new techniques using the videos that are posted as well as finding lots of samples. If you are interested in learning more or want to set up a time so we can spend time working on projects and learning new techniques, contact me. 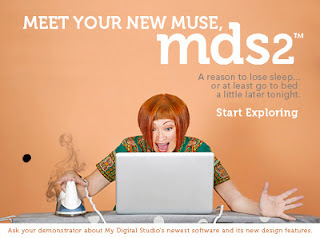 I will post some new MDS2 projects in the next few weeks.